Toshiba's Qosmio range is firmly aimed at the multimedia market. Built with flashy plastics, the Toshiba Qosmio X300-148 (£1299 inc. VAT) might not be to everyone's taste, but when it comes to gaming performance it really delivers good value for money. The 17-inch, 1440 x 900-pixel Super- TFT screen is good. Colours are crisp and defined, although it falls short of the Alienware when it comes to detail. DVDs look great and working with multiple windows is simple. The Super-TFT coating creates reflections, but this shouldn't prove a problem during home use. Graphics are provided by an Nvidia GeForce 9700 GTS GPU. This is one of Nvidia's more powerful graphics cards, but doesn't provide the gaming power of the Alienware M17-R1 or Asus W90, both of which run two GPUs. Consequently, the Toshiba's gaming performance is much poorer. There is 512MB of dedicated video memory, however, helping games to run smoothly. 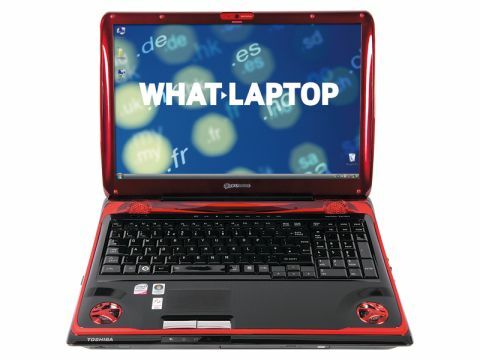 The chassis is constructed from glossy red and black plastics, which many users may find rather garish. Build quality is also poor. Despite weighing 4.1kg, the machine feels flimsy to the touch with the chassis bending under light pressure. The large keyboard also feels weak. This suggests durability could be an issue, which isn't great if you consider the punishment the keyboard takes when gaming. Nevertheless, the keys are large and very responsive – providing a smooth action. The touchpad is large enough and the buttons are defined. Intel's powerful 2.66GHz Core 2 Duo processor is supplemented by 4096MB of DDR3 memory. As a result, office performance is excellent and the laptop is suited to multi-tasking and running resource-intensive applications. The 320GB hard drive is fairly standard, but provides plenty of space for not only your games, movies and music, but also for loading large applications. The laptop is one of the lighter machines, but still won't suit regular mobile use. 802.11n Wi-Fi will provide the fastest wireless connection to the internet currently possible. A Gigabit Ethernet connection is also included. The eSATA and FireWire ports provide plenty of options when it comes to fast data transfer. Three USB ports let you connect a joystick or gaming mouse and an HDMI out port enables you to hook up the laptop to a larger monitor with ease. Despite the build quality issues, this is a decent gaming laptop for those who don't want to bankrupt themselves buying a machine. However, performance lags considerably behind the high-calibre competition out there.